Glen is a avid outdoorsman and a skilled craftsman with a deep appreciation for nature. He has been capturing nature on film and bringing it home since 1995. His Gallery and Studio is one of two Victorian homes he has lovingly restored. Glen photographs national parks with a special interest in the Adirondack Mountains of New York. 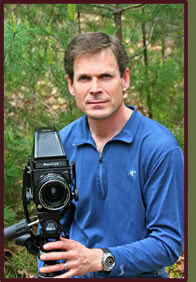 Glen often refers to himself as a purist using only film, absolutely no digital photography. He shoots both color and black and white film with a most discerning artful eye. Glen does not believe in manipulating the images either by using props, "posing" pictures or extreme color enhancing filters. He has been quoted saying "what you see is what you get" it takes talent and a natural ability which he says is a gift from God. Over the years he has received accolades and awards for his work and has often appeared in or graced the cover of Adirondack Life Magazine. Photographs are printed on Fuji Crystal Paper. We now offer Premium Fine Art Paper. This paper is like watercolor paper. It has a smooth surface. Museum quality, 100 plus year life. Call 518 882 2047 for further information. we no longer live in Ballston Spa. We are now in Galway NY.